Four men stand poised at the edge of the Nu‘uanu Pali lookout, ready and alert. They come prepared, armed with ropes, carabineers, helmets and gloves. 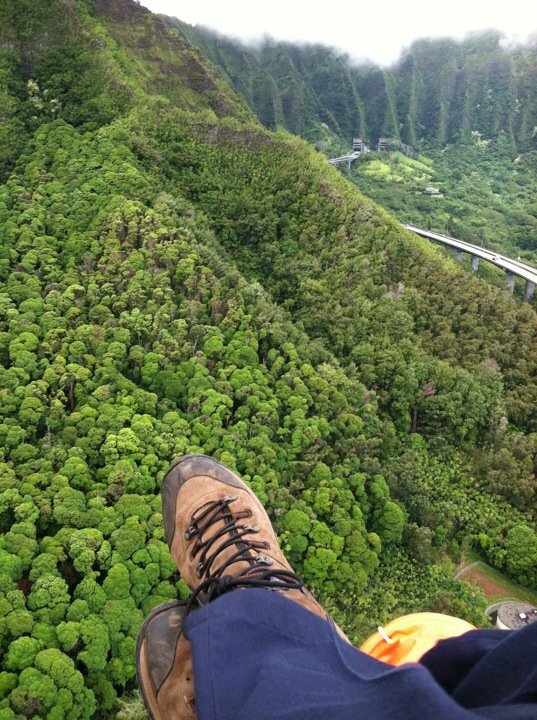 These men are members of the Honolulu Fire Department’s elite Rescue 2 team, and today, as part of their mountain rescue training, they will rappel nearly 270 feet down the windward face of the Pali. “It’s kind of close to free-falling; you can walk down or bound and free-fall. It’s the next best thing to flying,” said Randy K. Ebright, a member of the Mililani Mauka rescue squad who has been with the fire department for 10 years. In 1795, on the same precipices of the Ko‘olau Mountain Range, King Kamehameha and his warriors battled against the O‘ahu armies. It was there, at the “Battle of Nu‘uanu,” that Kamehameha’s warriors sent more than 400 O‘ahu soldiers over the sheer, forested cliffs. Undefeated, he united Hawai‘i under a single ruler. More than 200 years have passed, and the former battleground is now a popular lookout known as the Nu‘uanu Pali State Park. It is a Thursday morning in August, and the overcast conditions predicted for the day have yet to materialize. As 10 a.m. rolls around, drivers on the Pali are treated to an unusual sight: men are dangling from the cliffs above them. said Bryan Keolanui Kau, engineer and acting-captain at the Mililani Mauka fire station, referring to the past two years when their unit found decomposed bodies during their annual rappelling drill. “We can do a lot of training in-house on a tower, but when you actually go out into nature you’re faced with different anchor points and obstacles. [It] just makes you think on your feet a little more,” said Kau. He has been a firefighter for 19 years, the last 12 of which were spent with the elite Rescue 2 team. 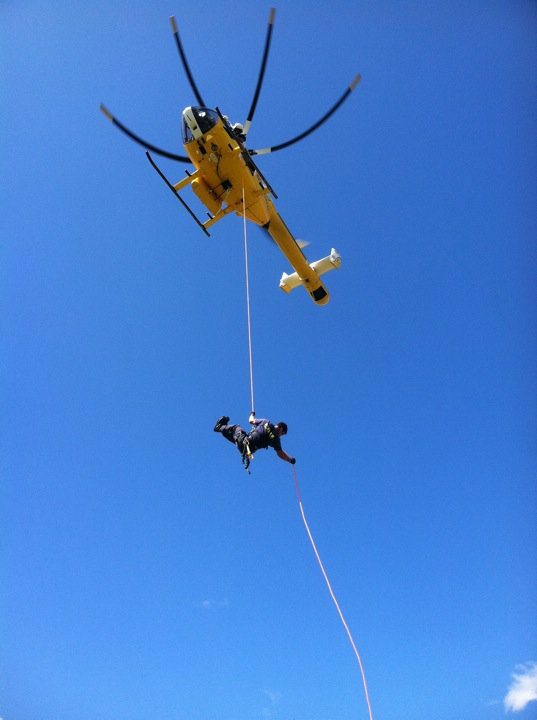 For this squad, rappelling out of a helicopter or carrying injured hikers for several hours is as routine as it is exciting. At first soft-spoken and a bit hesitant to express an exact opinion, Ebright speaks more openly when asked about the best parts of his job. He favors mountain rescue and rope work because of their technicalities. He compared the rappelling that they do to a Trust fall; if you trust the rope like you trust the person behind you, then it’s not scary. The gratification that comes along with helping is often inextricably intertwined with gruesome injuries and sometimes death. The Mililani Mauka team was the first on scene at the helicopter crash in Kaneohe bay on March 29 that left one Marine dead and three others in critical condition. Unlike traditional firefighting or other agencies where protocols and roles are more rigid, members of the rescue company are trained to make decisions independently, without the aid of a captain or senior team member. One of Kau’s most memorable rescues involved rescuing members of the Coast Guard when their helicopter crashed during a training exercise off ‘Ewa beach. Coast Guard policy prohibited the Coast Guard team from putting more men in the water and rescuing their own members. “We get out there and there’s seven Coast Guard boats driving around,” said Kau. “Who the hell knows what they’re doing, and the helicopter wreckage is right there, but no one goes in and gets their guys. We go in and get the job done. What we do is so much more than fires. We are the RIT (rapid intervention team) team. We are the guys that go in and get our guys [other firefighters] when they get in trouble. Engineer Kau and firefighter Ebright emphasized the importance of creativity and the ability to be a leader as necessary qualities for potential recruits. In an effort to adapt themselves to a variety of circumstances, the 18-person squad is required to do a minimum of two drills every month. One simulation has to be in the mountains and usually involves rope work (tying knots, working with pulleys), while the other is a water operation. The crew at Mililani Mauka always exceeds this requirement. “Sometimes we’ll just get dropped off on a ridge and they say, ‘OK see you back at the truck.’ And we have to bushwhack, and we have a rope and basically get ourselves down,” said engineer Kau. In addition to mountain and ocean rescue, they specialize in auto extrication, confined space rescue, structural collapse rescue, and are in the process of learning trench rescue. Although being a member of a fire rescue team member can be risky, the rescue positions available on O‘ahu are highly sought after. Most firefighters wait more than five years before even earning an interview. Patience and fortitude, along with a high degree of competence, are not optional for this job.